I have a long list of burger-places I should and want to try before I go home. 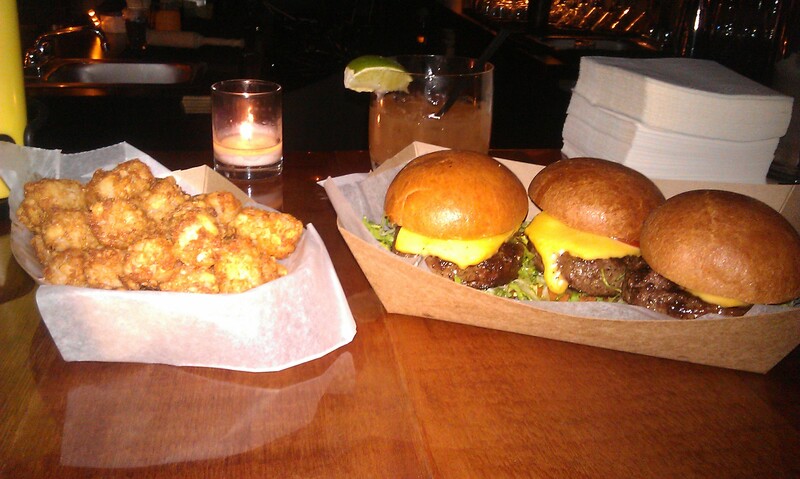 The Spotted Pig and Le Parker Meridien are two of them and I had POP-burger on the list – until the day. Sometimes you just need to do what you need to do. Someone cancelled a date? Don’t have any friends? Waiting for a better day? Well – sometimes you just need a burger! Tonight I was upset over various reasons so I put my headphones in my ears and went for a long walk. Realised that I can’t wait for other people, (in general – people are slow and boring) so I went to POP-burger to get another tick off my list. Their branch close to Union Square (83 University Place) had a really nice and chilled atmosphere with many different types of tables setups so I think it’s perfect for both dates, hanging out with friends, larger groups or like me – alone in the bar. Got annoyed that the menu didn’t look like the one I had seen on their website (you were supposed to get 2 small burgers for $7 something) so I “had” to order 3 small burgers for $12. Chose Tater Tots (cubes of hash browns more or less) as a side and a Passion Fruit cocktail to that – without the cranberry juice thaaaank you! My mood needed the sourness. And the score? Cocktail was perfect! Tater Tots were good but want to try the fries next time. Burgers had a really good taste but I can’t decide if I like this trend with these sliders?! And no way I could finish 3 of them! Perfect for sharing though! But POP-burger was all in all a really nice place and I would love to come back here. With my boyfriend, or a large group of friends or – all by myself!